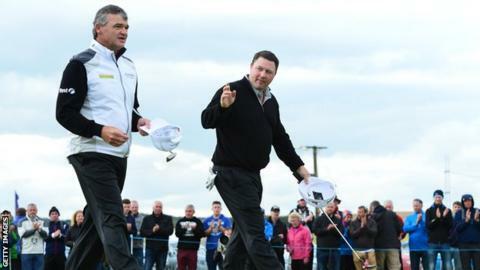 The Paul Lawrie Match Play lost its tournament host at the last-32 stage. Lawrie was edged out by fellow Scot Chris Doak, losing by one hole at Murcar Links in Aberdeen. Doak advanced despite three bogeys and two double bogeys on his card, with 1999 Open champion Lawrie describing his own performance as "horrendous". Doak will take on England's David Howell in the third round, the Englishman having cruised to a 6&4 win over another Scot, David Drysdale. Top seed James Morrison was beaten 2&1 by Johan Carlsson, who will play fellow Swede Robert Karlsson in the last 16. Chris Wood had been the first man to progress thanks to his second 5&4 win of the week, the 27-year-old from Bristol needing just two and a half hours to beat Spain's Jorge Campillo. Local favourite Richie Ramsay beat the man he succeeded as US Amateur champion, Italian Edoardo Molinari, while 2010 US Amateur champion Peter Uihlein eventually defeated 2013 winner Matt Fitzpatrick on the first extra hole. "I knew it was going to be very tough today," said Ramsay, who holds the course record at Murcar with a round of 62 in 2006. "Edoardo is a class player and when he gets going with the putter, he's probably one of the best in the world." The best tie of the third round could be between Scotland's Marc Warren and former Ryder Cup star Nicolas Colsaerts, who defeated Fabrizio Zanotti and Trevor Fisher Jnr respectively on Friday. Lawrie will continue his duties as tournament host this weekend, saying: "I'll be here every day. I'll be in the sponsor's pavilion looking after them because it's not just about me playing this week. "My name is on the title so it's very important that everyone comes and enjoys it and has a good day, and I'll be in there doing my bit."